Another interview this week – this time with KB Inglee, a fine writer, a fellow Sister in Crime, and a good friend. Why a writer? Certainly not for the fame and fortune…or maybe it is? I wrote my first short story when I was in fourth grade. It was called “A Star for Rosanne”. Star was a horse, but I don’t remember much about the story. Marguerite Henry was my favorite writer at the time, so I wrote it as I thought she would. When my daughter was young I wrote children’s stories for her. I was in my 50s before I started writing seriously. Why do I write? I have no idea, I just have to. I am a New Englander with deep roots there. I have always loved history, so it was natural to start by writing historicals. Many years ago, just after I came up with Emily, I was on one of those internet communities that had nothing to do with writing. I made friends with someone who was also writing. He told me that I needed to do what I was writing about. I was shocked to find a living history museum within walking distance of my house. I started historical interpretation there. Delaware is not New England but I feel at home here. I have two face book pages, KB Inglee and KB Inglee, Author. I blog regularly at kbinglee.weebly.com. I dabble on Goodreads, and Ravlery from time to time. Why did you choose the genre you write in and how would you describe your writing style? My mother read mysteries and passed them on to me. I wrote my first Emily stories for her. I knew it was going to be either mystery or horse stories, maybe both. It was a longtime before I got started because I kept putting off the two things that scared me: characters and plot. You need a well-constructed plot for a mystery. Plot is still hard for me. Character turned out to be a snap. My stories are character driven traditional mysteries with a slight feminist twist. 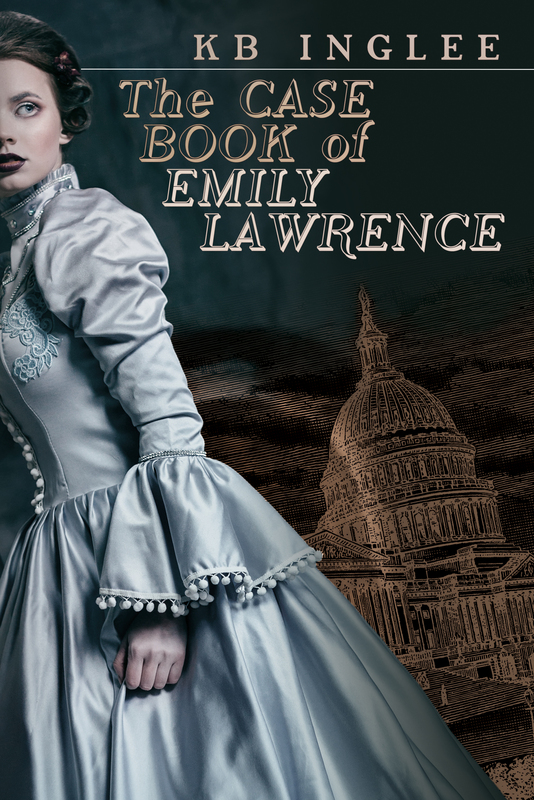 Tell us about The Case Book of Emily Lawrence. I’ve been writing Emily short stories for over 20 years. She and her friends were the first characters I developed. Case Book is a collection of 17 Emily stories starting in 1859 when she was seven, and ending in the 1890s. Emily is the daughter of a Harvard professor, who is expected to marry a professor and settle into an academic life. Instead she chooses a young man who wanted to be a detective. Most of the stories are of their life together in Washington DC, a few are about her life after his death. All are mysteries, but not all are crime stories. If you could live in any world from a book or movie, which would it be and why? I can think of lots I would like to visit, but none where I would like to live. The London of Sherlock Holmes, the countryside of Thomas Hardy, Colonial New England. Delaware in the years following the Revolution. I imagine you’ve been reading all your life (all great writers have). What was your favorite book growing up? I work at two living history museums. I tended a flock of heritage sheep for several years, I demonstrate a working water powered mill built in 1704. I read a lot, both fiction and non-fiction. Write for the joy of it, and if you are serious, persist. I had written nearly fifty short stories and four novels before I had anything published. I am putting together a second series about a young man in New England in the years following the Revolution. He takes on whatever task is at hand and pays a bit. He tutors young men for the Harvard Entrance Exam, he keeps the books for farmers who aren’t good business men, he teaches at Andover Academy for a few weeks. His best friend is his horse. I knew I could get a horse in there somehow. Iccarus and Medusa made it into print once. And All Our Yesterdays, an anthology of historical mysteries, published by Darkhouse Books. Hi, ladies and what a fascinating Q&A. I love how the heroine stuck with the detective instead of a professor. So do I, Vicki. Thanks for stopping by. It’s wonderful that you get to share your knowledge in two ways–through your books and your work in living history museums. Fascinating! All best. I agree, Micky. Also love how the two ways feed each other. When I read a detail in one of KB’s stories, I know it’s accurate. Thanks for your comment. I read the Casebook and really, really liked it. It’s a novel in stories! KB is one of my own historical consultants. I can vouch that she knows what she’s talking about. Good to hear, Edith. Thanks for your two cents. I’m fascinated by your emergence in living history, and your ability to use it in your writing. I do find that it helps to be very familiar with the situations you’re writing about, but we all need to do our research to keep things reasonably accurate. You’re right about the need for research, KM. I don’t write historicals, but I still need to check settings, etc., for my work to be believable. Thanks for stopping by, Victoria. I love this way of telling a story.